As a business owner, you wear many hats and your plate is full to be sure. And as a business owner, you are often the first person at work and almost always the last person to go home in the evening. You spend your days talking with customers and clients, coaching staff and even doing payroll. Since you are so busy and you play so many roles, it is not a big surprise when you forget to do something. That is, from time to time some things slip through the cracks and are forgotten. For example, you may have forgotten to have the locks changed our when you rented the new office space. Look, it’s fine, you are a busy person and you will get around to it when you have a chance. And when you do get around to it, you will be calling Bostons Locksmith, your emergency locksmith in Boston. Changing locks is a common job we do for business owners, but it isn’t the only job we do. Here is a list of all of the other reasons you might have to summon your Boston locksmith. Just as homeowners get locked out of their homes and car owners get locked out of their cars, business owners sometimes get locked out of their business. And while some of you might crawl through the doggie door or climb the tree in the backyard to gain entrance into your home, that isn’t a good idea when you are locked out of your business. Besides, it is unlikely that your office will have a doggie door anyway. 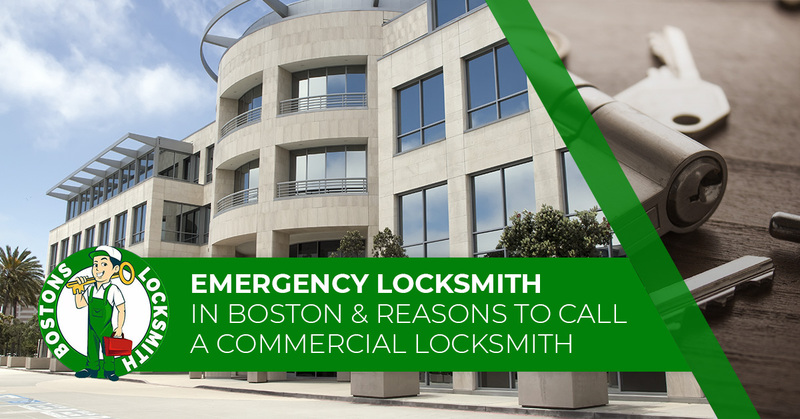 The best way to deal with this type of situation is to give your Boston locksmith a call, they can help. If you are a small business that has experienced a surge in clients or customers, you probably need to hire more employees. This is a good thing as growth is positive. In the past, an access system to your business didn’t seem necessary. But now, with the added employees, an access system makes more sense. A commercial locksmith can install outdoor security locks that can be accessed with a card or even indoor locks for individual offices. As a business owner, you may have to deal with the unfortunate experience of being broken into. It does happen. IN order to prevent thieves from breaking back into your business, you will want your security system re-coded. If you have a surge in staff turnover, it is a good idea to change up your security code just to be safe. The same holds true if you have to fire an employee and you don’t think you can trust them. Keeping property and inventory secure is vital to making your business profitable. We are a commercial locksmith service with several options for securing your building. Instead of using keys to enter a secure area, such as the offices, our locksmith Boston technicians can install a keypad lock. Give Bostons Locksmith a call.